Does Critz Victory Mean That Much? Second, not only did Critz win, but his 10-point margin was bigger than recent polls had projected. Third, Critz’ win makes for seven straight Democratic victories in House special elections–although that string may soon come to an end in Hawai’i. Fourth, as I mentioned in yesterday’s preview piece, this is the only district won by both John Kerry in 2004 and John McCain in 2008. 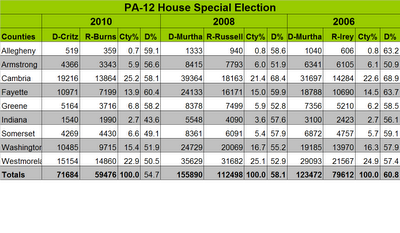 So, at first blush, the Critz win would seem to suggest a stalled Republican counter-trend. But I have to believe some of the difference between 2004 and 2008 is a function downballot of John Murtha’s problems between those two presidential cycles, and remember: Although Critz outperformed the polls he still underperformed an embattled Murtha’s share from less than two years ago. Seventh, Critz’ win gives Democrats a 255-177 margin in the House, with three vacancies. For the sake of argument, assume the GOP fills all three, for 180 seats total. That would give Speaker Pelosi a 75-seat majority, meaning that the GOP’s magic number to flip the House in November would be 38. Now, on the first and last points and the question of how generalizable this lone House special election result is, I realize Cook Political Report’s David Wasserman thinks that flipping the House is very possible (subscr. req’d), and Intrade buyers also believe the proposition is only a little worse than 50/50 (though price for GOP majority 2010 dropped today). But I’m starting to think–as I suggested in a post two weeks ago here at 538 (and many readers in their comments are also saying)–that the GOP’s House majority dreams are looking dimmer and dimmer. Witness this new AP-GfK poll out three days ago; also, see Paul Waldman’s latest American Prospect column on this subject, which is definitely worth a read. Nevertheless, I advise against generalizing too much about this victory. Although I think matters are better for Democrats than they were three or six months ago, there are still 5+ months to go. #N.B. : There was a third-party candidate, Libertarian Demo Agoris, in last night’s contest, but for table simplicity I left out his votes (2.3 percent overall) in order to compare simple, two-party shares for 2010 with the 2008 and 2006 results.